No. 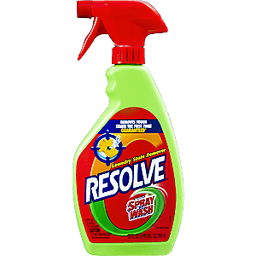 1 instant stain remover (Based on sales). On the road. Coffee break. Out to eat. Helps remove many fresh food & drink stains. Helps remove many fresh food and drink stains: coffee, tea, wine; spaghetti sauce; BBQ sauce; ketchup, salsa; grape juice; and more! Does not work well on grease, blood, ink. Tell us your Tide to Go story at tidetogo.com. Questions? 1-800-879-8433. Assembled in Canada from imported raw materials. Fresh Linen. fabric softener. ADD SOME BOUNCE TO YOUR DAY! 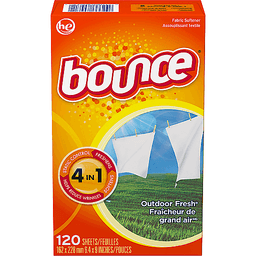 Bounce Dryer Sheets provide Long Lasting Freshness and help: Control Static - Repel Lint & Hair - Soften Fabrics. AUTOMATIC FRESHNESS AND STATIC CONTROL FOR ABOUT 2 OR 4 MONTHS! * *Depends on frequency of use and dryer settings. 40 SHEETS. 162 x 228 mm 6.4 x 9 INCHES. 6.4 x 9 inches (162 x 228 mm). HE. 4 in 1: Static control. Helps reduce wrinkles. Softens. Freshens. Questions? Information? Call toll-free (in US and Canada): 1-800-5-Bounce; 1-800-(526-8623). bouncefresh.com. Oh hi there, thanks for doing your part on recycling day. In part because of you, we can continue to make this box from 100% recycled paper (35% post consumer). 4 in 1 Benefits: Static control; freshens; helps reduce wrinkles; softens. Fabricated in: Canada. 6.4 x 9 inches (162 x 228 mm). With Febreze freshness. HE. 4 in 1: Static control; helps reduce wrinkles; softens; freshens. Questions? Information? 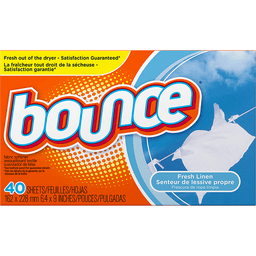 Call toll-free (in US and Canada): 1-800-5-Bounce (1-800-526-8623). 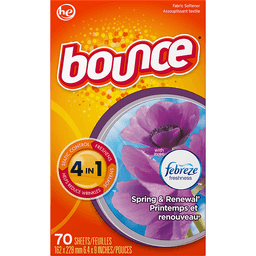 bouncefresh.com. Oh hi there, thanks for doing your part on recycling day. In part because of you, we can continue to make this box from 100% recycled paper (35% post consumer). Benefits: Static control; freshens; helps reduce wrinkles; softens. 1 sheet = regular loads. 2 sheets = large loads & HE full loads. 5 in 1 power! Tackle the toughest dried-in stains. Stain grabbing nubs. 5 in 1 power gel stick has 5 types of stain fighters with a special scrubbing top to help remove your toughest dried-in stains the 1st time! Grass & blood. Food stains. Soil & clay. Grease & oil. Drink stains. Ultra Concentrated Gel: stain grabbing nubs work the product deep into fibers to help break apart and remove stains; treat now and wash later - up to 7 days before washing; blue formula lets you see where you've treated then rinses away clean. Questions? Comments? Ingredients? 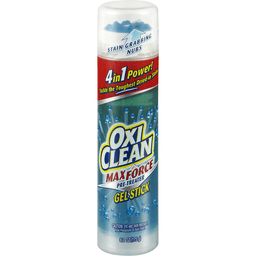 Call 1-800-781-7529 M-F 9AM-5PM ET or visit www.OxiClean.com. 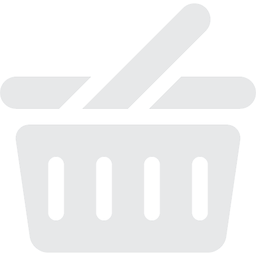 39 small loads (This package contains up to 39 uses if measured as indicated for small loads). HE: Safe for all washing machines (HE compatible for small loads. Follow the manufactures use and care guide for proper dispensing of the fabric conditioner). For more information and latest Snuggle news visit www.snuggle.com or become a fan at www.facebookk.com/Snuggle. This bottle contains 25% or more postconsumer recycled plastic. For a full ingredient list, please visit us at www.sunproductscorp.com or call 1-855-835-5786. 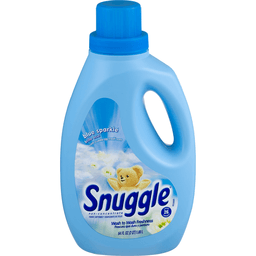 Snuggle® Plus SuperFresh® Fabric Conditioner. Eliminates tough odors. 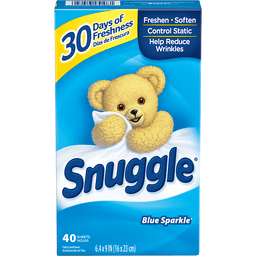 Snuggly softness® + Odor eliminating technology. Fabric conditioner. Safe for all HE washing machines. 30 Loads*. EverFresh scent. 31.7 fl oz (1.98 pt) 937 ml. 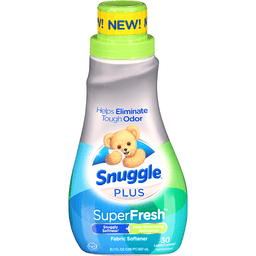 Enjoy the Snuggle® benefits you love like Snuggly Softness® & Long-Lasting Freshness plus it is specially formulated to attack tough odor like body, pet and outdoor. 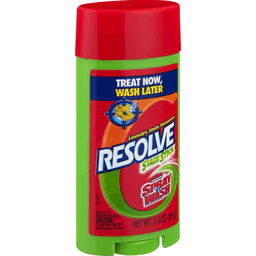 Helps capture & block tough odor. Releases a powerful fresh scent. Contains cationic surfactant and fragrance. *Regular loads. U.S. Patent Nos. D543,861; D627,655; D637,916; 7,665,638. For a full ingredient list, please call us or Visit us at www.sunproductscorp.com. Question Comments Call toll free 1-855-835-5786 or Visit www.snuggle.com. ©2016 The Sun Products Corporation. 38 loads (Delivers 38 regular loads/uses when measuring to line 1 on scoop). Use in all machines including HE. Chlorine free. America's No. 1 versatile stain fighter based on units sold. Over 101 ways to use! Tablecloths; uniforms; whites; colors; denim; socks. For tough laundry stains soak for best results. Cleaner, whiter, brighter. Add to every load. Safe for all colors. Carpets; upholstery; grout; patio. Contains no phosphates. Got a tough stain, need ingredient information, or have other questions? Visit OxiClean.com or call toll-free 1-800-781-7529 Monday through Friday 9 am - 5 pm ET for stain tips. 39 small loads (As measured for small loads). 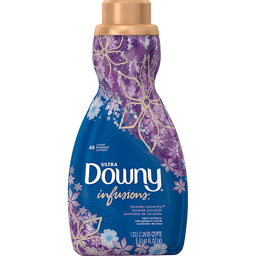 Make Ultra Downy your next purchase! Ultra Downy gives you comfortable softness, and noticeable freshness - in just one tiny cap! 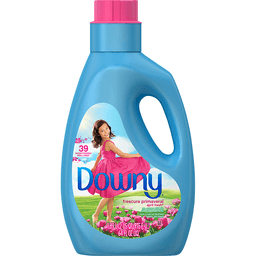 Talk to Downy 1-800-688-Soft (7638) or visit us at www.downy.com. Bottle made from 25% or more post-consumer recycled plastic. Treat now, wash later! 1st time stain removal. Treat Now, Wash Later! - simply apply the stain stick when stains occur and wash up to 7 days later at your convenience. 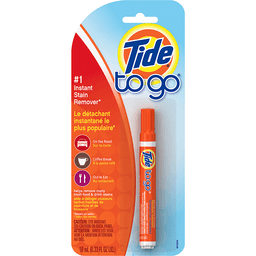 Perfect for Traveling - Stain Stick meets TSA (TSA - Transportation Security Administration) carry-on 3-1-1 size requirements. Treat while on vacation and wash upon your return. Hints from the Experts: May be used with other laundry additives. Safe for all colorfast washables and works in all temperatures. Always test garment before using by applying to an inconspicuous area. Not recommended for use on khaki, fluorescent clothing or washable silk. Do not treat garment while wearing. Certain stains like rust, dried paint, permanent ink, or bleach damage may be impossible to remove by an laundry stain remover. Contains no phosphorus. Our home. Our planet. Save Energy: Great results even in cold water! www.ourhome-ourplanet.com. Questions? 1-800-228-4722. For ingredient and other information, www.SpraynWash.com. Health. Hygiene. Home. Made in Canada. 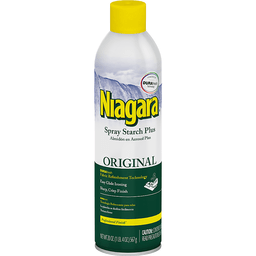 Niagara® Spray Starch Plus Original. Powered By Durafresh Fabric Refreshment Technology. Easy Glide Ironing. Sharp, Crisp Finish. Professional Finish®. Net Wt 20 OZ. (1 LB. 4 OZ.) 567 g (585 ml). For use on light-weight fabrics like cotton and wool. Imparts softer, but crisp finish. Please recycle when empty. Questions or Comments: www.niagarastarch.com. © Niagara Starch Company. Clings, penetrates & lifts. 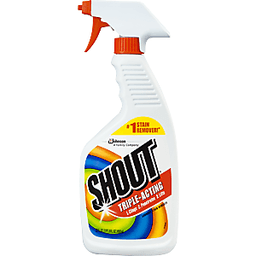 50X more concentrated than in-wash powder (when applied directly to the stain). SC Johnson - A family company. Get help on the spot from Shout Call 800-558-5252 www.shoutitout.com. Environmental Facts: Contains no phosphorus. Bottle made of 30% post-consumer content; please recycle. Learn more at www.scjohnson.com. A family company since 1886 - Fisk Johnson. Questions? Comments? Call 800-558-5252 or write Helen Johnson, Racine, WI 53403-2236 USA. Works in HE & standard washers. For tips, tricks & offers visit us on Facebook. facebook.com/shoutlaundry. www.shoutitout.com. 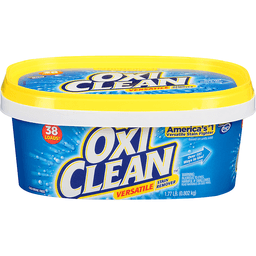 Better on everyday stains (vs detergent alone). 1st time stain removal. 1st time amazing stain removal. Contains no phosphorus. Questions? 1-800-228-4722. For ingredient information, www.SpraynWash.com. Health. Hygiene. Home. Our Home - Our Planet: Save Energy: Great results even in cold water! www.ourhome-ourplanet.com. Made in USA. 48 loads (medium loads). Fabric protect. HE compatible. Safe for all washing machines. Experience: 6 Benefits in Every Drop: long lasting fragrance; helps reduce wrinkles; less fuzz & pills; superior softness; keeps colors bright; helps prevent static. 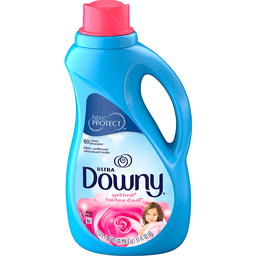 Talk to Downy: 1-800-688-Soft (7638) or visit us at www.downy.com. Bottle made from 25% or more post-consumer recycled plastic. 60 loads (medium loads). Fabric Protect. HE compatible. Safe for all washing machines. Better together. Talk to Downy 1-800-688-Soft (7638) or visit us at www.downy.com. Bottle made from 25% or more post consumer recycled plastic.